Technique: Mosaic, tile and grout. About: Space Invaders defines himself as an UFA – Unidentified Free Artist. He chose “Invader” as his pseudonym and always appears behind a mask. As such, he can visit his own exhibitions without any visitors knowing who he really is! Invader pastes up characters inspired by the 1978 arcade game Space Invaders, made up of small colored square mosaic. He studied at the Parisian art school Ecole des Beaux-Arts and although his favorite subjects are video game characters, he varies his designs, often allowing them to blend in with their surrounding environments. “My mission is to invade the planet with video game characters made with tiles that I put on walls in big cities all around the world. Like a mission, I really stay two or three weeks and I try to spread the invasion all around the city”. You can see the map of all invaded cities on his website. Even if the artist claims he doesn’t have a political message to deliver to the world, the way he operates is in itself already political, acting illegally for 99% of his installations. Invaders prefers to see his work as artistic experimentation rather than political opposition. Decontextualizing art to bring it to the streets, to surprise everyday people, while constantly creating new pieces he hopes to leave a print not only on the cities but also on peoples’ minds. In 2010 he was arrested for placing a mosaic on the world-famous Hollywood sign and was forced to pay a fine. Where you can see it: Paris, Amsterdam, Berlin, Miami, New York, Tokyo, Hong Kong… In 2000, Space Invader began showing his works in galleries such as the Magda Danysz Gallery in Paris, the MAMA Gallery in Rotterdam, and at the Museum of Contemporary Art (MOCA) in Los Angeles. 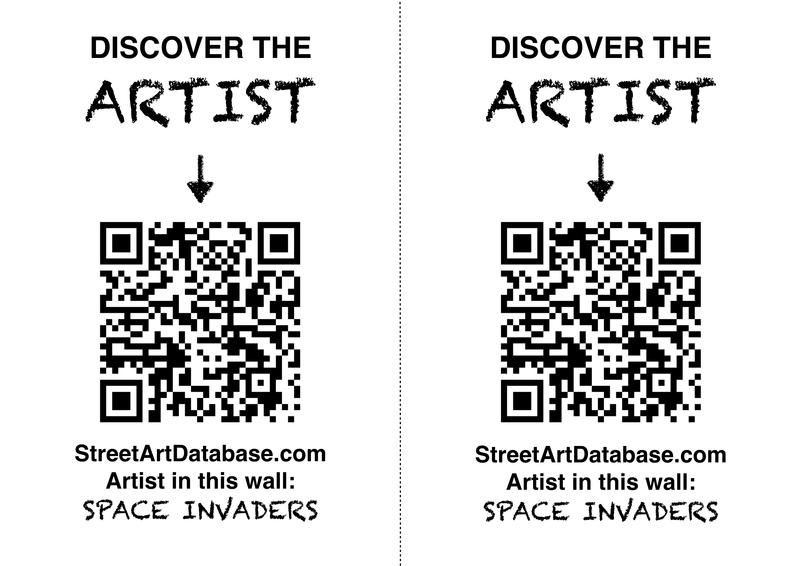 PRINT CODE: help tagging Invaders in the streets of your city! Posted in mosaicTagged mosaic, Space Invaders, street artBookmark the permalink.